From the outside of the house takes the shape of a white cube giving nothing away of the beauty that lies within. 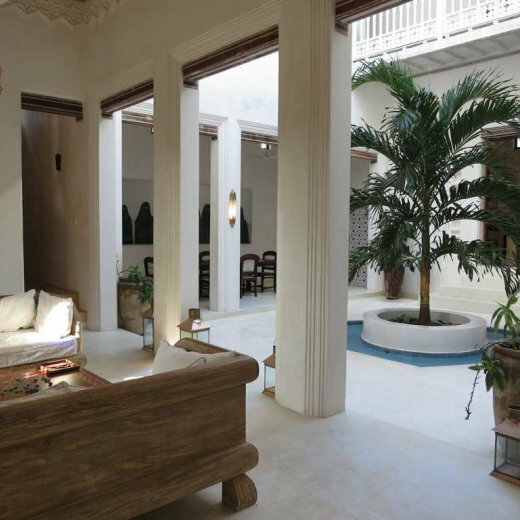 Once you enter through the Lamu curved door you step into a Swahili Lamu style house designed and built on the lines of sacred geometric principles, a hallmark of original Arabic design. As you arrive up a grand staircase, which brings you into the white courtyard with a turquoise Moroccan tiled pool, and central palm tree a large sitting area complete with a recessed wooden Moorish Musharabia and two sofas greet you. You’ll notice the waft of jasmine and frangipani and an unusual coffee table, home to a new board game known as the Glass Bead Game, but that is another story. In the evening the courtyard is truly magical and great for relaxing, entertaining or watching a film with a house projector. The house sleeps six people comfortably, having three double bedrooms all with one suite bathroom with hot showers. One has a spare bed as well. The bedrooms are located on the first floor. Each bedroom faces the outside, across the sand dunes and the villages, and also inside down the courtyard. This design keeps the bedrooms, and the house, cool up on the terrace under the 'makuti' roof you will find the Sunset bar – a wonderful space to relax or entertain yourself during the day with built in sofa, hammonks and floor cushions. The dining area, with a table that can seat twelve, is also located on this floor, across the courtyard with a guest cloak with shower. The large kitchen is also accessed from the courtyard. The kitchen is fully equipped although you may not wish to become acquainted with too much during your stay, as you will be well looked after by the house's Gaba Gaba crew of Toomy & Abdullah. Your wish is their command. It’s the perfect place to enjoy your evening sundowners while watching the sunset across the dunes. The bar is equipped with a fridge, sink and ipod friendly sound system.